Eel Marsh House, further isolating him. Later still, he is physically isolated by the weather, and estuary that covers up the Nine Lives Causeway, trapping him in the claustrophobic atmosphere of the house. The novel is structured to create the effect that Kipps is receding into the mist and darkness, even as he enters deeper into the mystery. Key scenes where he is further isolated are when his torch smashes, trapping him in darkness with unseen terrors and sounds, and when he rescues Spider from the bog, becomes disoriented in the mist and finally blacks out. Ironically, the most brutal isolation of all - the destruction of his new wife and child, happen in full public view, in a busy London park. The dead Mrs Drablow was also isolated in the house, though Kipps supposes she was used to it. Samuel Daily tells him it made her peculiar - and he too, seems to be rattling around in too-large spaces in his house with his wife. Love make it light and bearable - Daily's kind wife, and for Kipps, the presence of Spider - showing loneliness as a type of isolation that can be banished by love, just as the torch banishes darkness and fear. This brings out one of the key themes of the book: isolation from love as a bitter, destructive force that corrupts everything around it. Isolating effects on the contaminating desire for revenge, the inability to forgive, let go and forget. 1. 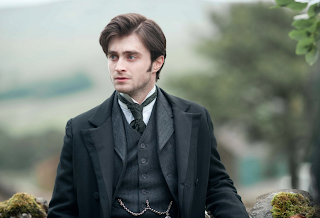 Arthur Kipps; Kipps' ignorance isolates him. His child-like naivety sets him apart ironically because he thinks of himself as the sophisticated Londoner. 'dreadful disfigurement of a burning'. 'Her passionate love for her child, her isolation with it ... which at first she fought bitterly again and finally gave in despairingly' - despair is the deadliest of sins (losing hope) - children are often a symbol of hope. 5. Social and Historical Context, as a noble woman JH has no legitimacy without a man and is unable to keep her child and is rendered isolated, powerless, and when she returns as a ghost, the force of her bitterness, desire for revenge gives her huge power. Depending on whether we identify her with the mists and the tide, she is isolating and controlling Kipps, finally killing his wife and son in similar fashion. Betrayal. She is made silent even when she comes to visit he son, being unable to tell him that she is his mother. Social convention makes her an un-person, denying her her true status.